The DirectIN Button-Box provides accurate response data with unsurpassed speed. Attractive and easy to use, this USB box will get response data to your PC or Mac in under a millisecond. The DirectIN High Speed Button-Box v2012 offers researchers a sleek, exceptionally durable and user-friendly method of collecting response data with virtually any software application. The time it takes for a button press to reach your computer is less than 1 millisecond. Whether you are using a Mac or a PC, simply unpack it, plug it in, and you are ready to go. It works with virtually all software because the computer will simply think someone is pressing the keys 1 through 9 on a regular USB keyboard. You can also have professional-looking response labels in no time. Printed labels of any kind can be slipped easily under the clear protective button covers. 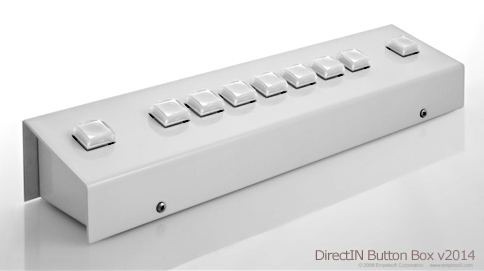 The DirectIN buttons are beautifully engineered and designed with top of the line input switches. When you press one of these buttons you get a nice tactile feedback and a soft click to know that you have pressed it. The soft click engineering is a great advantage when you have many participants pressing a lot of buttons in the same room. The DirectIN box itself is made from durable cold-rolled steel and finished with a tough white powdercoat--this basically means that it is going to last and look good for a long time. Responses are delivered to the computer in less than one millisecond. Button caps have a clear outer shell which can be easily removed in order to place printed response labels underneath. DirectIN PCB v2012 Button Boxes come with a full one year parts and service warranty. See our store page for ordering information.